Winter is coming! Winter is coming! If you watch Game of Thrones, this will be a familiar phrase. The Koala and I were quite late to Game of Thrones. We started watching at season 3 and binged on 30 episodes in about 3 weeks. 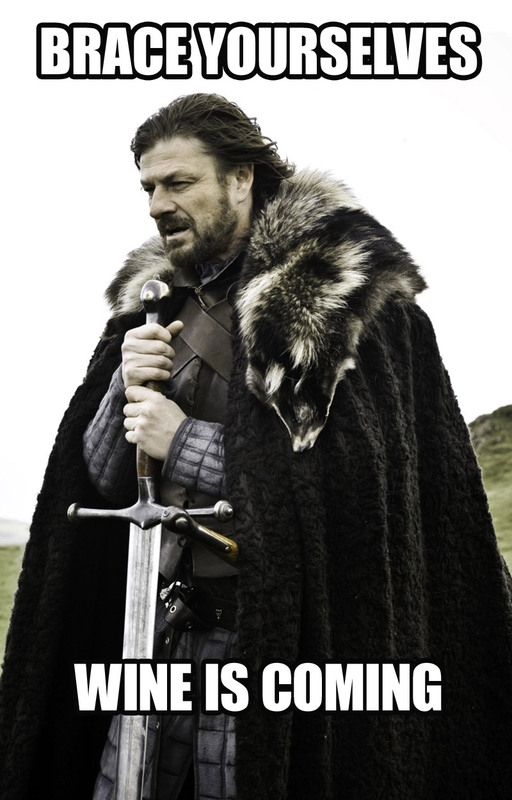 Now that we’re caught up we have to wait week by week like peasants. PEASANTS! A little while ago, my friend Miss A told me about a Game of Thrones-themed wine-tasting event. Called Game of Rhones, it’s on Saturday 4 July at Shed 10 on Queens Wharf. The event has been celebrated in Adelaide, Brisbane, Melbourne, and for the first time this year, Sydney and Auckland. A celebration of fierce reds from the Rhone Valley in France representing faraway lands. There will also be 20 wine producers from our own land to battle them. Vote for your favourite wine and the winning house will rule the iron throne (or something). Tyrion would approve. Game of Thrones attire is encouraged. If you feel silly dressing up in Game of Thrones gear, just know that after a few wines, you’ll be glad you did. Auckland’s event will be catered for by Bird on a Wire. 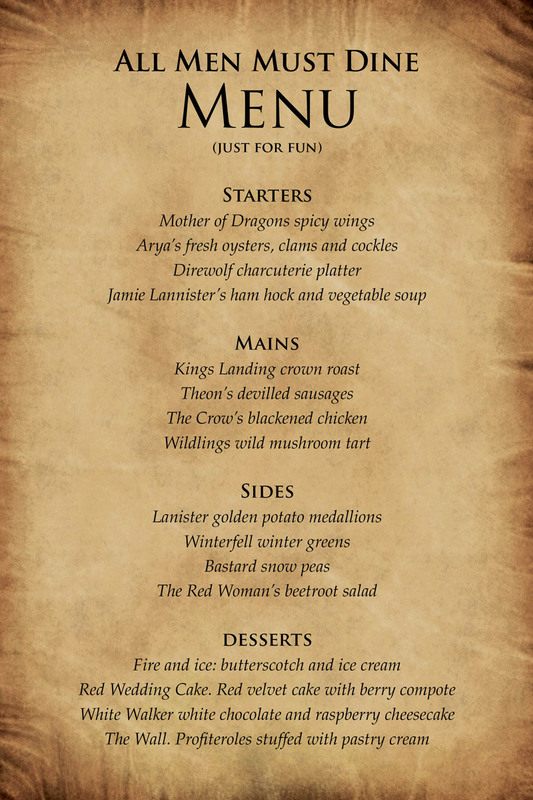 I don’t know what their menu will be, but I thought it would be fun to make up a Game of Thrones menu and maybe squirrel these away for a mid-winter dinner party. Again, THIS IS JUST FOR FUN and not a menu for the event. Early Raven tickets were $40 and regular tickets are $50. The ticket price includes all tastings and a wine glass. Food (provided by Bird and Wire) is extra. For more information see the Game of Rhones website or their Facebook page here. I will be there in costume, with a prepped liver, an appetite and a camera. Will you? 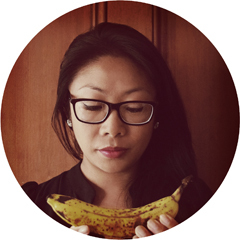 #NZbloggers are hosting a weekly blog post challenge. This week’s theme is Winter and you can check out other posts on this theme here. And welcome to the GoT peasant party…that’s why I’m waiting till Season 3 is at the finale before starting it. I REFUSE to be a PEASANT dammit! I would totally go to that event! I love this. And I’m totally going to the wine event. To fancy dress, or not to fancy dress…. I’d go as Dany if I could! (Love her outfits!) Unfortunately, I have work that day, boo. Would love to have taken a bite of Jamie Lannister’s ham hock *wink wink*. I saw this a few weeks ago and lost it! The website looks amazing and I so want to go. But at the same time I was really considering doing Dry July :S so I don’t know how that will work. Could you start dry July a week later?